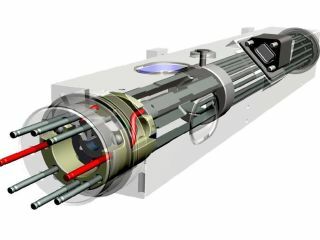 A computer-aided drawing of the Deep Space Atomic Clock under development at NASA's Jet Propulsion Laboratory. Can a better clock save an agency millions? Perhaps only in space. NASA is preparing to send a new atomic clock into deep space that the agency hopes will improve space navigation and science while saving money. The clock, now under development at the Jet Propulsion Laboratory in Pasadena, Calif., will launch in 2015 as a payload in an Earth-orbiting satellite. The mercury-ion clock will stay aloft for a year, while scientists study how it fares in the tough conditions of deep space and whether it improves spacecraft navigation. NASA currently uses super-precise atomic clocks on Earth to time navigation for spacecraft. Ground crews send a radio signal to a spacecraft, which turns the signal around and sends it back down the Earth. Using timestamps on the signal, scientists measure how long the signal's entire round-trip journey takes to determine the spacecraft's position. The distances in deep space create signal delays, however, so NASA wants spacecraft to carry their own atomic clocks that can send a time-stamped signal to Earth, eliminating one leg of the journey. Further in future, they hope spacecraft with atomic clocks on board can receive signals from Earth and perform their own timing and navigation without waiting for a response from home. An on-board, deep space atomic clock will work like a GPS for spaceships, according to NASA. The new atomic clock will be accurate enough to account for the way gravity, space and time affect the relative motion between an observer and an observed object. GPS satellites today need to correct for that drift. In lab now, the clock doesn't drift more than one billionth of a second every 10 days. The clock will also be several times lighter and smaller than any other ever flown, according to the project's description on NASA's website. A deep space atomic clock will let NASA perform more time-sensitive planetary landings and fly-bys, according to the NASA news release. It will also cut costs and improve science, said the clock's lead researcher, Todd Ely of the Jet Propulsion Laboratory in Pasadena, California. "Adopting [a Deep Space Atomic Clock] on future NASA missions will increase navigation and radio science data quantity by two to three times, improve data quality by up to 10 times and reduce mission costs," he said. An on-board atomic clock will save "many millions of dollars per year," California Institute of Technology researchers wrote in a paper published in 2007. NASA previously announced plans to send the clock into space, along with two other new space technologies, in August 2011. With the latest news release about the clock, dated April 9, it seems the project is still on track to fly in a few years. Corrected Apr. 12: The original story stated the deep space atomic clock will go into space in an Iridium NEXT satellite. While that was the original plan, Iridium has since changed its payload hosting plans and the clock research team is now looking for a different satellite to host the clock. The original story also incorrectly stated that in current spacecraft navigation, radio signals originate in the spacecraft. Actually, they originate on Earth, are sent to spacecraft, then return to Earth.